After a fantastic final day, England's U16 team has finished in 4th place in the European Youth Team Championships. England's U16s have now finished 4th on both occasions that the competition has been held. 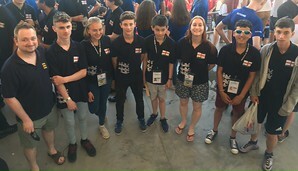 With three matches to play the team was in 10th place and hoping to capitalise on matches against lower-ranked teams to move into a qualifying place for the 2018 World Championships. A large victory against Denmark, and two maximum scores against Scotland and Ireland, saw them leap up the table to fourth place, securing another great result for the young team, and an invitation to play in China next summer. The team was: Oscar Selby & Henry Rose; Liz Gahan & Andy Cope; Alex Pemberton & Theo Anoyrkatis; NPC: Mike Bell; Coach: Sarah Bell.